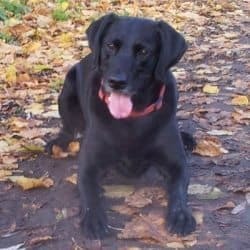 Every dog owner (particularly Labrador owners) should be given with a guide on how to take care of sore arms after walking a dog that won't stop pulling! Unfortunately for me, I'm serious. Pulling is a common problem that frustrates many dog owners because it can be a difficult habit to break in your dog. If you want to save your arm forever, I suggest putting in place a long term strategic training program that takes time, patience and dedication, but is certainly something you should resolve to do. We have a fantastic guide for you to follow you can find by clicking here: Train your dog to stop pulling. The ‘no-pull’ solution dog harnesses have come to the rescue. If you use one of the best dog harness leads, your dog is discouraged from pulling, giving your arm a break – or avoiding one! 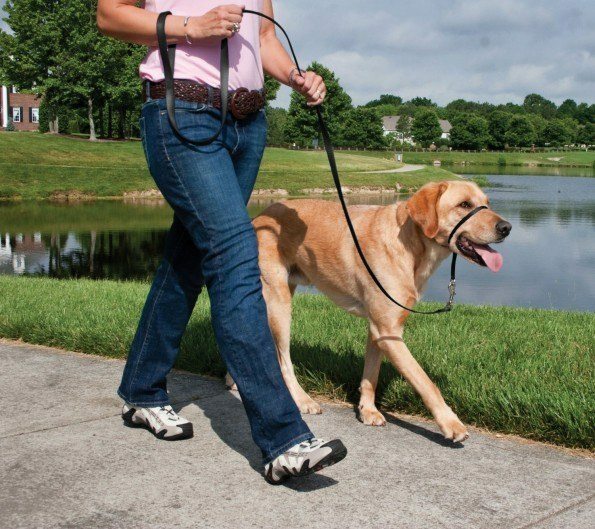 – and helping to manage the pulling problem until you’ve successfully trained loose leash walking. There are a large number of different no-pull harness options available on the market, some good, some bad, some easy to use, some that look like a complex puzzle to put on your dog. To help you with making the right buying decision for your four-legged friend, we’ve gathered below a few of the best no pull dog harness solutions on the market, describe their pros and cons and why we recommend them. Let's take a brief look at each so you know which is the best dog harness for your specific needs. 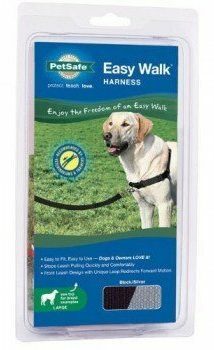 As the name suggest, these harnesses have the attachment for a leash on the back of the dog, sitting right behind the shoulder blades. Good harness to use if you like to go jogging with your dog. You can attach your dog leash to your belt, and it clips handily onto the back of your dog so it isn't in the way while jogging. A harness that attaches a leash to the back is the worst kind of harness to use with a dog that likes to pull! So do not use them for this case. With the dog leash attached to their back, it can actually encourage pulling. It feels good to a dog, they like to oppose the pulling from behind with more pulling going forward. It's exactly where sled dogs have their rope attached, on the back. So avoid this if your dog's a puller. Again, as the name suggests, these harnesses have an attachment for the leash at the front of your dog, right in the middle of their chest. 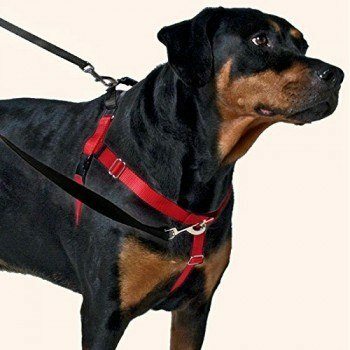 ​​​​​This is the harness type you want to use to help stop your dog from pulling! ​Because the leash is attached to the front of the dog, if they pull the effect is that the leash gives a tug on their chest to the side, therefore turning the dog toward you and not allowing them to move forward. So if they pull, they get turned. And if they turn, they aren't heading forward which is where they want to be going and why they are pulling. This is NOT the result they are after. A dog soon learns that they only get to go forward if they do not pull while wearing such a harness. And so - voila - the problem is solved. It's not a good idea to use a front attaching harness if you run or jog with your dog. 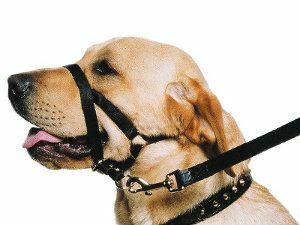 Front attaching harnesses are for stopping pulling while on a WALK, not a run or jog. The straps could become tangled, and this would be dangerous for you and your dog. For this you will need to train them not to pull and use a back attaching harness instead. Not really a harness in the strictest of terms, but they are frequently described as such and are always grouped with the harnesses by retailers. Regardless, they are a great no-pull dog harness solution so I will include and discuss them here. How Does A Head Collar Work? Not to be confused with a dog collar, a head harness or head collar is a small harness that is fitted on and around a dog's head, with an attachment for the dog leash right under their chin. The full force of this goes into turning their head toward you. Once their head is turned, it stops them dead in their tracks. So pulling only makes the walk stop, it effectively has an averse aspect to it (the walk is stopped). They learn to not pull while wearing the head collar. You simply MUST allow your dog time to slowly get used to wearing the collar, how it feels and works, before ever using it on a walk. Some training and acclimatizing is needed and this could take perhaps a few days, though many dogs do take to them right away. OK, let's get to the point of this article and discuss a few choice no-pull dog harness choices that are going to stop your dog pulling while out on a walk. The freedom no pull harness is a multi-purpose harness with many fantastic features, making it our top pick of all no pull solutions. It has a martingale style loop on the back so you can attach a leash to the rear and if your dog pulls, it puts gentle pressure on their chest and discourages pulling. The other benefit of the rear attachment is in case you like to go jogging with your dog. However, the more effective no pull solution is the attachment for a leash on the chest that will gently steer your dog if they begin to pull. You can attach a leash to the back, to the front, or even both to give yourself different levels of control and anti-pull aversion. The harness has a soft velvet lining to ensure it's comfortable for your dog and to prevent friction sores - a complaint from some people after the use of other harnesses. The harness is extremely durable and the manufacturer will replace free of charge up to 2 chewed straps if your dog does manage to do damage. The harness is available in sizes all the way from XS to XXL and is available in a wide array of different colors and styles, so it's suitable for all and any dog. This is the best no pull dog harness we give top marks to and is our number 1 recommendation! It currently comes with full details of a step-by-step training system to help you stop your dog pulling long term. This simple, front of chest attaching harness gives you the ability to gently steer your dog to the side, stop their pulling and redirect their attention on to you when they pull. The placement of the leash attachment assures this happens automatically every time they pull and so it very quickly teaches them not to pull while walking. With the harness arrangement, stress when they pull is applied across their shoulders and not their neck or throat so it's considered safer and less stressful than many other 'no-pull' solutions available on the market. The straps won't stress them out, so you won't be stressed out, either. Made from strong and durable nylon webbing, with quick release snap attachments makes it very easy to put on and remove. You won't have to fight to get their front legs out of this harness. Available in 8 different sizes for different girths and 7 colors, there is a harness to suit all dogs sizes and owners tastes. At almost half the price of our top recommended 'Freedom no pull solution' seen above, this harness is fantastic value. As previously mentioned, body harnesses aren't the only non-pull solution on the market today. Head collars are also available and some say are even more effective than traditional, chest attachment harnesses. If you can't find a harness that works well for your dog's girth, head harnesses are another good option. We discuss two of the most effective and most popular options below. This head collar from 'The Company of Animals' works on the idea that where a dog's head goes, their body will follow, much in the same way we steer a horse. So with the ability to gently guide your dog's head, you can easily steer them where you want them to go, turning their attention toward you and stopping them from pulling forward. The Halti does take some getting used to and there's a little concern that if a dog lunges strongly they could strain their neck, but the risks are small as evidenced by the sheer number of people who have used it and left positive feedback in reviews. You must take the time to get your dog used to wearing this device as it will be a novel and strange thing for them to wear at first. But most dogs take to it very quickly and easily. The Halti is a highly suitable and efficient management tool for strong pullers that we're happy to recommend. The Gentle Leader is the number 1, 'no-pull' training solution recommended by vets and trainers. The gentle leader by 'Premier Pet Products' is much like the Halti, gives you control of your dog by way of you steering their nose and where their head goes, their body is sure to follow. Therefore, if they do pull, their nose automatically gets turned, their head follows and instantly they become facing you. Your dog cannot pull if they are facing toward you so with this device, as soon as they pull they instinctively stop and the problem is managed...and within just a few minutes of first use! Available in 5 sizes from XS to XL, and 8 different colors, there is a size and color to suit every dog. The gentle leader comes with a full training guide and comprehensive DVD to teach you how to use the device to train your dog to stop pulling permanently. Like all the harnesses on this page, they are short term solutions. Most dogs will pull again if they know they aren't in the harness, so you still need to train loose leash walking and with the gentle leader you get a course to follow free! 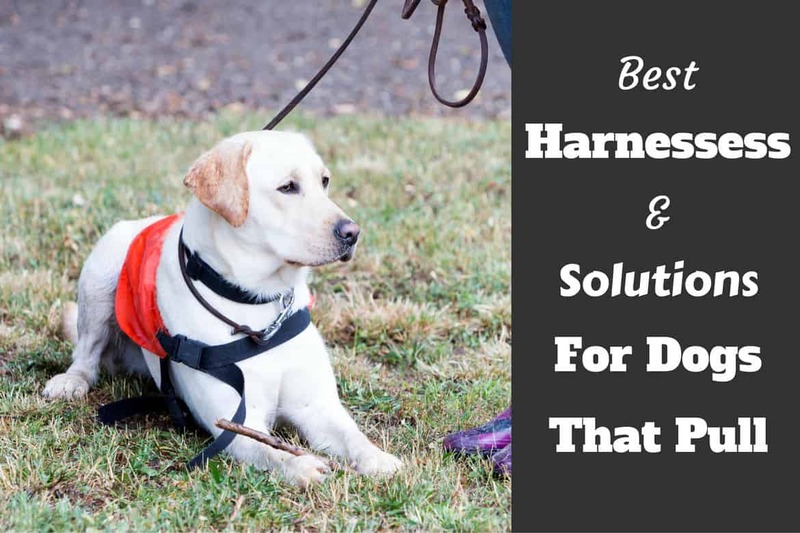 There are many more harnesses available than the few you've seen here: Padded ones, different colors and designs and so on, we just simply don't have time to do every single dog harness review! Whether you have a puppy or dog, you can find the best dog harnesses, from all the major brands and at the best prices on Amazon by clicking here: The best harnesses and 'non-pull' solutions on Chewy, filtered to show only the highest rated and most popular. Please be aware this page contains affiliate links and Labrador Training HQ receives a small commission if you make any purchases through any such links. This has absolutely no effect on the eventual price that you pay and we are very grateful for your support. 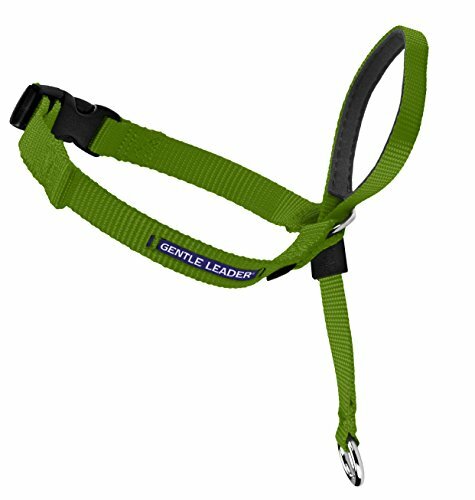 How would be the best way to use if you were walking with other dogs on leads in the other hand? You can probably have no pull leashes for all the dogs, that way you can have an equal amount in each hand with minimal to no pulling. If the dogs are not yours you can explain to their owners the benfits of having a no pull leash.  I found the information that you provided to be insightful and helpful. My daughter and I have two wonderful dogs that we rescued from the Humane Society of Utah. Each dog does very well on just a leash attached to their collar when they are taken out for walks separately. However, when they are taken out together, they become nightmares. It becomes a competition of who can pull the hardest on their leash and bark at the most people/dogs/mailboxes/birds. All of our neighbors hate our dogs and us as well because our dogs seem so vicious. Anyway, if you could give any advice on muzzling or not muzzling, lemon spray, shock collar, etc. a dog that barks while out on walks, I would appreciate it. I would strongly sdvise consulting a professional trainer in your area or joining in a group reactive dog class. I have a 2 (nearly 3) year old male Labrador Retriever called Lucius. He is very well behaved on the lead when out for a regular walk in somewhere he knows, however if he sees a cat or a dog he instantly wants to be friends and lunges towards them! He’s fine when he meets them and is very polite and well socialised. Would a front clip harness be better for him? I currently have walked him on a slip lead but I feel this doesn’t help stop any pulling and I took him on a longer walk the other day and the constant lunging towards other dogs is having an effect on me now. I dont want to dislike walking him as we have had many long fun walks together when there are no distractions. I’m planning to buy one of these but I’m still thinking if what would be the best leash for my 10 years old lab. This is insightful and helpful article, thank you for this. I love Labrador because they are wise and trainable. I will definitely choose what is the best harness that suits to my Labrador and will not totally hurt him at all. I have a 3 year old male dogue de Bordeaux. He is lovely but when it comes to walks my shins literally feel like they have splintered!!! He is so hard to walk he pulls constant, he doesn’t care if he chokes himself I panic most of the walk because he is needing to stop and give himself some time to breathe. Is there anything you can suggest so he stops pulling and I can actually enjoy walks with my boy?